​THE SITUATION: As we prepare for the global visitation, we must know how to worship the Creator, Yahweh Elohim, according to His method rather than our own opinions and comfort zone. 1,000s of Hebrew groups are spreading the doctrine that we must keep The Laws of Moses, which includes observing dietary laws, tithing, various feast days, etc. THE PROBLEM: The fate of millions of souls are on the line by observing these physical ordinances which Yahshua Himself fulfilled and "TRANSLATED" into its higher spiritual equivalence. To continue following these laws communicates to The Father that Yahshua's death, burial, and resurrection wasn't good enough for their salvation. ​THE SOLUTION: Invite the meek and the humble to the Wedding Supper of The Lamb to search the scriptures and find even in The Law where The Physical Law would be made Spiritual. Together we can then save lives in spirit and in truth, as it is written. Please submit Questions or Comments about this class here. There are 10 questions you should be able to answer from this class. FREE Download: Our 7 Core Daily Reading Plan. 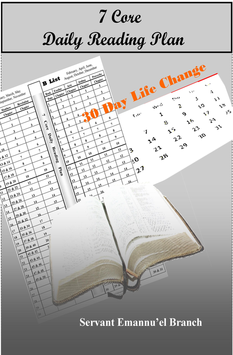 30 Days or less to take your Bible knowledge and understanding to the next level.